Get Ready for Endless Hours of Imaginative, Fun Play with This Darling Jungle Animals Play Set by Kleeger! Are you scouring the net for the best, plush jungle animals play set to keep your little one entertained? Or maybe you’re on the look-out for the most creative pretend-play toy gift for your next baby shower party? Designed with the highest quality materials that are safe for babies and toddlers, this safari animals toy set is sure to impress any baby boy or girl! Stimulate Your Baby’s Sensory Responses and Captivate Their Attention with Beautiful Colors, Textures and Real Animal Sounds! Silky soft and squeaky with incredible colors, these toys will attract your baby’s eyes and keep them entertained for longer! All toys make fun, real animal sounds that your child will love. Impress Any Child with a Great Gift! Perfect for both boys and girls from 6 months and up, this plush animal toy set makes a wonderful first birthday or baby shower gift that is sure to please kids and adults. Boasting a plush, convenient handle and Velcro closure, this beautiful play set carries everywhere in a breeze. Ideal for little hands to carry around, it packs easily in the car, baby bag or stroller and travels with you everywhere. Backed by a risk-free, 1 year warranty of complete satisfaction, you have nothing to lose. So why wait? TEACH YOUR BABY ABOUT WILD ANIMALS:This adorable, plush,jungle animal toy set is the best way to introduce your precious little ones to the wonderful animals of the jungle! Complete with a plush carrier in the shape of a tree and four amazing, stuffed animals making real sounds, this play set is sure to keep your little baby entertained in between meal and nap times. Plus it’s a great way to start teaching your little angel about the colors and sounds of these magnificent, wild animals. INSPIRE IMAGINATIVE PLAY: Watch your baby cuddle, squeeze and hug these adorable animal toys or spend some quality time with your older toddlers and preschool children, while helping them develop a vivid imagination, creativity, motor, coordination and pretend-play skills. The cute colors and silky soft textures are sure to impress any child and keep them focused for longer. EXTRA DURABLE & SAFE FOR BABY PLAY:Made with top quality, long lasting materials under the strictest safety control standards, this darling play set is perfectly safe for babies and toddlers aged 6 months and up. 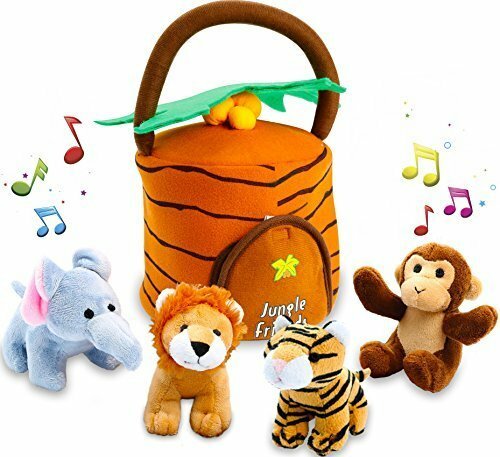 The set includes the jungle house, where animals sleep (6″ L x 6″ W x 10.5″ H), a plush tiger that roars, a plush elephant with real sound, a fun monkey with a natural monkey sound and the king of the jungle, the wild roaring lion (dimensions for all animals: 3.5″ L x 1.9″ W x 3.1″ H). CARRY WITH YOU EVERYWHERE: All of your plush safari animals are easy to bring with you anywhere, anytime! Thanks to the convenient, tree-shaped carrier, this play set allows you to safely store or transport your toys wherever you go! Their lightweight and compact design with a plush handle and Velcro closure makes the carrier perfect for safe-keeping all the toys in one place. I also makes a perfect first birthday, baby shower or Christmas gift idea that is sure to impress. BUY RISK-FREE: Being so sure about the excellent quality and durability of these plush, jungle animal toys, we offer you a hassle-free, 1 year warranty of complete satisfaction. So what are you still waiting for? Order your safari animals play set now and let the fun begin! Click “Add to Cart” now!